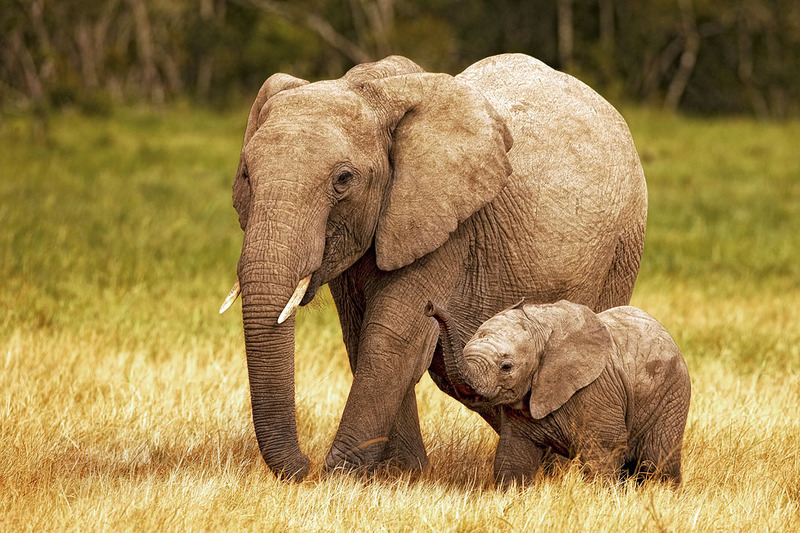 An African elephant, when born, weighs around 200-250 pounds and stands about 2-1/2 to 3 feet tall. After 22 months of being pregnant, you can imagine an elephant cow is quite ready to deliver her very large "bundle of joy." A new calf in the herd gets a great deal of positive, nurturing attention. The members of the herd, which are a tightly knit family unit, will gather around the new arrival and caress and touch it with their trunks, welcoming it to the world. Since a baby is born almost completely blind, this behavior immediately teaches the youngster that it must discover its new world by using its trunk. With their 60 to 70 year lifespan, they have a longer development in their young lives, and rely heavily on their elders to teach, nourish and protect them into young adulthood. In this portrait of a young elephant and its mother, the little one is enjoying the warmth of a Kenyan afternoon with his mom, exercising the 100,000 different muscles in his trunk...and getting in a little trumpeting practice at the same time.